No place we keep parrots is 100% safe. Actually it seems that accidents in the aviary were more dangerous than flying freely. But it was mainly the things we were not expecting that caused us the most problems flying outdoors or in the aviary. The things we did expect were not the problems we expected them to be. These are not nearly the easily answered questions people think they are. In fact, people who have little or no experience flying parrots have all kinds of fears that are not justified. No one can blame them, that is human nature, to make guesses about what might be dangrous. 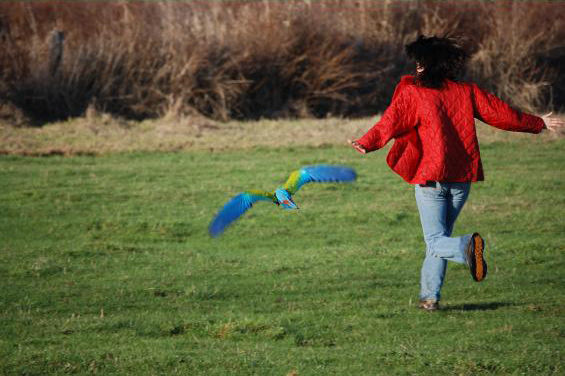 Flying parrots outdoors does have its dangers, but they are not what most peopel think they are. It is the unexpected that usually gets us, just like in the rest of life. I understand the concern and fears related to flying parrots. 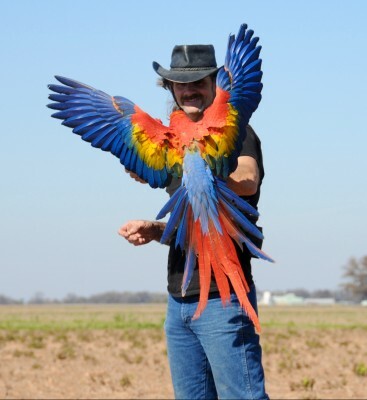 I also understand the question people have as to WHY fly parrots at all? I also understand the concern that regular people cannot learn this and that only professionals should do it. But again, I must point you to hard evidence. I have had great success teaching students through my classes where we discussed the theory and science I rely on and then spend time working with them as they work with their young birds. These classes result in their birds skillfully flying complex locations. More than one of our students went a few weeks later and bought another bird and trained it all by themselves. In one case it was a HY that he bought. 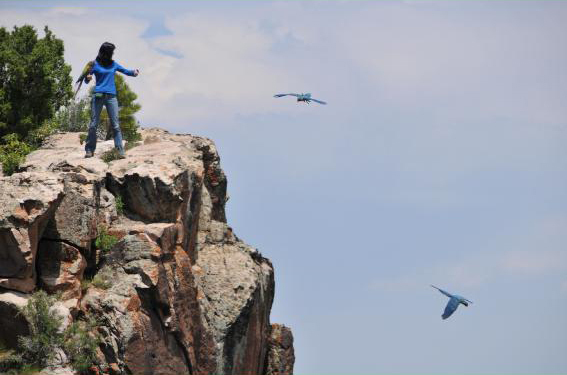 I have photos of this bird flying level 5 locations, from the top of 1000 ft cliff where there is no recovery possible if the bird does not come back on its own. The point being these skills are easily learnable with the right instruction. Most professional bird trainers do NOT understand how to teach these skills, mainly because they do not fly birds this way or know how. Once you have experienced a bird this way, it is very hard to go back to keeping it mostly in a cage, even large cage. I built a 30 ft x 100 ft aviary and it was not enough. I still needed to let them fly outdoors. The birds are ALIVE when flying and everything about them is expanded and celebrated in ways I have never experienced before. It is like owning a dirt bike motorcycle and keeping it in the living room, never taking it out to the track. The person that actually rides that motorcycle on the track has an appreciation and understanding of the motorcycle that the person who keeps his in the living room will never understand. And all his fears will remain grounded in theories he lacks experience to validate. But unlike the motorcycle, which could not care one way or the other, our birds LOVE being loose every day, even though they sometimes are chased by hawks. They get to LIVE as birds, instead of living as a hamster. They are designed through natural selection to be incredible atheletes of the sky and if you are around them very long as flyers it shows and is obvious how much they enjoy this aspect of their lives. Once you experience this there is no going back. The level of understanding that comes from being around them as flyers will change how you view parrots and training. The approach I use is simple and easily learned by anyone. Not all parrots though can be trained this way. Instead of working with the birds we have, we select the best possible bird for achieving success and then we structure EVERYTHING to insure success. The process is fun and highly rewarding. And then once the bird is trained, the relationship and activities that you both have available are unequaled. The reason not all birds can be trained this way is because the way nature trains flight requires many things to be learned during certain stages of development. Once that stage of development is passed, it is much more difficult to learn those things, sometimes even impossible. As has been noted, there are dangers involved with flying parrots outdoors. So for me, I prefer to train only the student that has every advantage and thus the greatest chances of success. Yes I can train older birds but the risks are much higher. And if I am teaching a new trainer, the last thing I want is a difficult bird for them to work with. I want the new trainer to have the easiest bird possible. It is far safer for both of them this way. 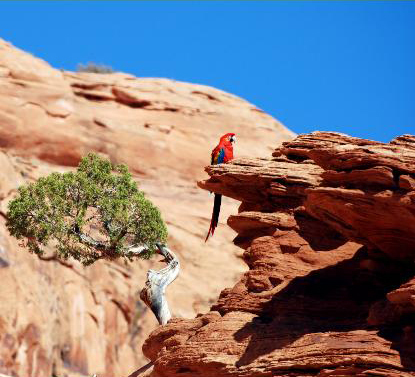 In the wild the young parrot would learn to fly through the trees at full speed without poking its eyes out with any of those tiny branches, it would learn to fly with a flock and to communicate with its parents and other birds in the area, it would learn to use local land marks to navigate back to the nest area or to water sites. All this is learned BEFORE weaning. The bird cannot get to the food to learn to feed itself if it cannot do all those things. Think about the mental stimulation going on in that little head during those processes, the neural activity involved. Then think about the mental activity of the baby bird that grows up weaned by most breeders. The breeder is insuring the physical body is healthy but what about the mental development? This is a very very important stage of development and the brain needs that level of stimulation to properly develop. Neurobiology is making this fact more and more clear all the time now. 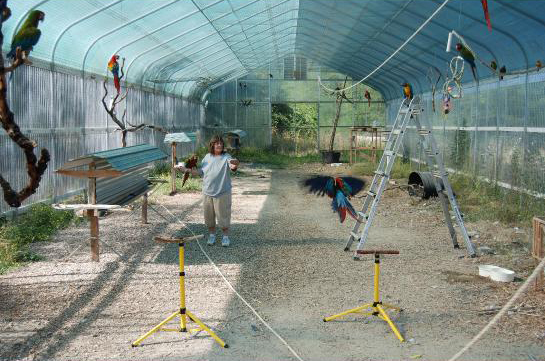 Aviculture is still in the dark ages when it comes to the way parrots are raised. Someday maybe people will realize how important it is for these birds to have their mental needs also tended when raising baby birds. I see two styles of show flying: Point to Point (A to B) and Freestyle. I see five styles of flying for most pet owners: Indoor, Point to Point, Freestyle, At Liberty and Sport. Competition Flying has not yet become reality. I don't care too much what the names are but I think we should be able to identify which style of flying is going on when discussing our training. Indoor: Indoor flying, or Aviary flying, is generally the safest style of flying. This is where the birds are confined and protected by walls, wire or netting but have sufficient space to do some flying. Point to Point: A to B flights, A to A flights or A to B B to C, etc. These would be very directed flights with little or no tolerance for variation from the intended flight plan. Typically these are shorter flights. These are often used for shows where time and space is limited. This kind of flying is often a first stage learned before advancing to other styles of flying. Freestyle: The handler sends the bird out to go fly where ever it wants to fly and for however long it wishes to fly but it must return to a designated landing perch (and not land any other place) - typically the landing is on the handler. Some shows are doing this kind of flying and some pet owners are also doing this kind of flying. This style of flying can also be a stage of learning achieved before advancing to At Liberty flying. At Liberty: The bird is turned loose and is free to go where ever it wants and do what it wants until the handler calls the bird back to a specific location. This gives the bird the most control of its activities. Usually these are well trained advanced birds but in some cases these will be birds that are untrained but controlled only by the location and timing of their feeding. At liberty flying is usually done at home or at a nearby park and is the only flying style that can be done unsupervised, though of course this adds additional risk factors to consider. Sport: The bird is flown in a variety of challenging locations and conditions. 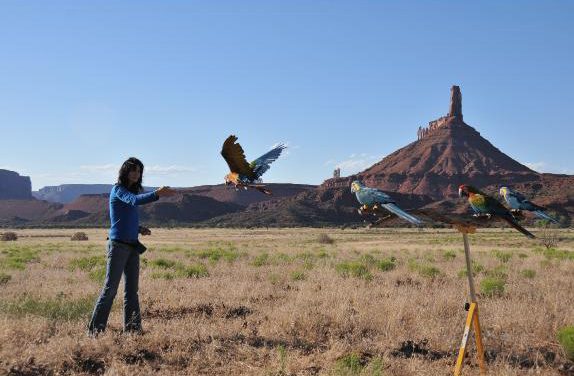 Sport style of flying is where the birds master skills not normally needed for the other styles of flying and it requires a high degree of teamwork between the handler and the birds. Competition: The birds are flown to specific tasks in a competition with other flyers. Such tasks may include recall promptness, directed flying to selected perches, duration of time in the air, or a cross-country agility course. I did not use the term "sessional" because it seems to me that a session of flying is more about the duration than the style. I did not use the term "unstructured" or "structured" because both At Liberty and Freestyle could be called "unstructured". I mention the food controlled untrained birds here because I have personally seen Chris Shank let untamed cockatoos loose and then get them back into their cages for feeding later that evening. I have also done this with unhandlable Blue Front Amazon, getting him back inside his cage every night through feeding. Jim Dawson Wrote: "IMO. most bird shows follow a formula that is based on moving birds quickly through the arena, lest you exceed the extremely short attention span of the audience. There is no time for complicated behaviors, unless its something that mimics human behavior -- like talking or playing basketball. A to B's are about all of the flight that can be squeezed in before time is up. I hate to say it but that's all a lot of show trainers know. I've worked with a lot of them and many have never tried to do anything more complex." I have seen several shows that were only Point to Point (A to B) flying. But lately I have seen a couple that have had much more freestyle flying included. I see this as a welcome change. Though if everyone else starts flying this way in their shows also that means people will not be as impressed with my 9-10 freestyle and At Liberty birds all loose flying at the same time during our shows <grin>. I think the audience LOVES to see these guys flying loose and under their own control. My guys delay my show all the time because they do more flying than I intended but it only seems to cause the audience to be just that much more impressed. It simply blows people's minds that they can be loose to do their own thing thought our day and during our shows and still they come back when we call them down. And if Ariel (Scarlet) and Gleam and Dretti (Blue Throats) or Boomer or Grace (Calicos) do several large laps instead of the two they are normally supposed to do, then the audience patiently watches and waits and then applauds just that much louder when they do return. I have no doubt that people will sit through more flying because it offers just so much more value to them than do the simple and short point to point flights. Plus people only get to see them "jinking" with the longer flights and never with point to point flights. And yes Point to Point flights can be trained with higher weight birds. I do not weigh any of my birds and each of them get all the food they want in the evening. And I get good responses doing the Dollar Bill trick where the birds fly out into the audience to retrieve dollars and bring them back to our stage. Last year the three were doing this about 300 times per day and no one was underweight - each trip earned them a sunflower seed and they continued to work until they were visibly bulging and just too full to fly any more <grin>. These are point to point flights though one of the points is variable and identified by an audience member waiving money in the air. We really love this trick. We try to give everyone a chance to do it at least three or four times <grin>. I think I am seeing more of this freestyle flying at zoos and theme parks. When ever we get a chance we like to visit the zoos in the areas we do our shows in. And their bird shows are always of great interest to us. "I think someone bashed the womach's on here last week, and it got me thinking about asking the question of what "camp" the free flyers are in." There are several different "freeflying camps". From what I can tell we have the womach camp, the Steve Martin camp, the Joe Krathwohl camp and the Chris Biro camp. People like Hugh Choi are in the Joe K camp. The womachs are trying to create their own camp but essentially are also in the Joe K camp. The Joe K camp is essentially a falconry based approach to training flight. Weight Management and strict recall response are heavily practiced by this camp. Mostly this camp flies A to B and some freestyle flying. People like Janet, Sid Price, Chris Shank and Barbara Hiedenriech (not really sure on Barbs camp since I have no knowledge of her doing any flying in recent years) are in the Steve Martin camp. The Steve Martin camp is similar to the falconry approach but is softened by inclusion of more OC material and less of a reliance on weight management - though Steve is reported to use weight management fairly often for his shows. Strict recall response are heavily practiced by this camp. Mostly this camp flies A to B and some Freestyle flying. I will let people chime in on their own if they want to be listed in the Chris Biro camp. The Chris Biro camp uses OC but relies more heavily than the others on coordinating with the influence of evolution and instinctive tendencies. The Chris Biro camp does not use weight management at all (at least extremely rarely) but instead relies heavily on natural appetite, favorite foods, social interest and play interest. This camp flies A to B, Freestyle flying and Sport flying. From what I can tell the Chris Biro camp publicly demonstrates the most advanced flight skills in their birds of any of these camps. Recall is practiced by this camp but Rally Point Fidelity is considered more important than recall.